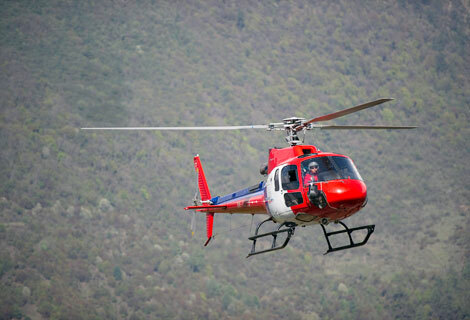 Uncategorized – Summit Helicopters Pvt. Ltd.
Captain Stephan Seggasser carried out a successful recovery flight of a dead body of a Russian climber from Kajuri (17,800ft) this morning on our B3 helicopter. A survey flight for the proposed Hydro-Project at Bhimphedi was conducted this afternoon on our Helicopter AIK- AS350B. A group of five board members of the multinational company ‘BINA PURI’ including former senator of Malaysia- Yang Berhormat Senator Tan Sri Datuk Tee Hock Seng, JP flew to Bhimphedi for the proposed Hydro Project survey. They flew to the proposed site directly from Kathmandu Airport and back. Bina Puri Holdings Bhd is a public listed construction company on the main Board of Bursa Malaysia Berhad, with 35 years work experience in civil and building construction both locally and internationally. Building Hyatt Regency, a luxurious five star hotel in Kathmandu was a part of their project. Their diverse business activities include investments, civil and building engineering management, and property development, highway concessionaire, quarry operations, manufacturing of construction materials, polyurethane system house, utilities and hospitality management. We feel fortunate to have been a subject of their interest in our country once again and we hope that we can thank them in one way or another for helping develop a nation. We look forward to serving you in future. On the 14th of November 2009, lost Slovenian mountaineer Tomaz Humar (http://en.wikipedia.org/wiki/TomaC5BE_Humar) was found dead on the remote mountains of Langtang region(at 18000ft) during a search mission organized with Fishtail Air. 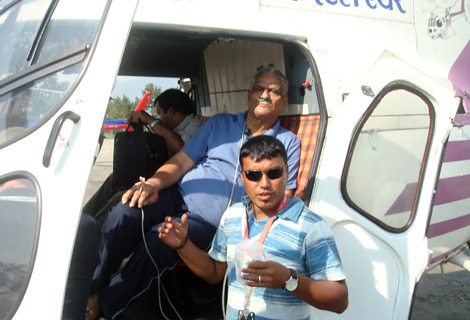 This was the first time an evacuation through Human Sling Operation was successfully conducted in the history of Nepal’s High altitude rescue mission. This mission was led by Swiss company Air Zermatt. 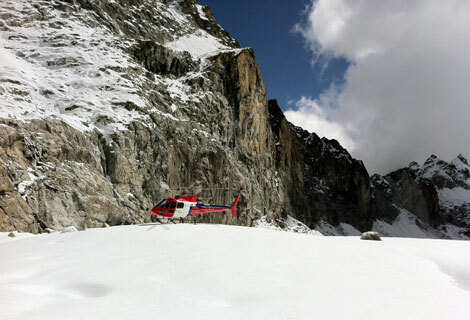 Thereafter Air Zermatt and Fishtail Air collaborated to establish a Helicopter rescue station. A team of Swiss National Television led by Frank Senn and Hari Thapa with his camera team from Nepal-the same team who were behind the award winning film “Sherpas-the true heroes of Mt. 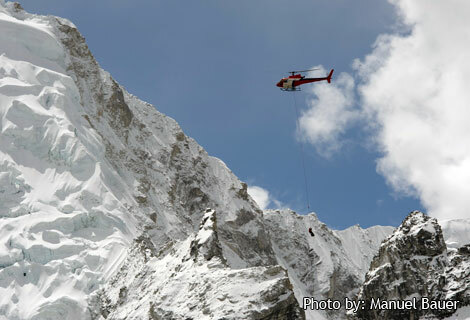 Everest” planned to follow and film not only this unique and difficult rescue operations but also the risks that pilots and rescuers have to take. The demanding rescue missions already are something unusual for a geographically gifted country as ours, filming it was something else. It is something new but at the same time it caters to the vision of making our Mountains a safer zone. The making of this film has taught us a lot and they wish to bring the same awareness amongst us all so that we never stop learning and exploring. This film mostly shot in Kathmandu, Khumbu region, Manaslu region, Mt. Dhaulagiri and Mt. Annapurna was to show the start of a new and important decade in the mountain rescue and tell the story of the people who made this happen. 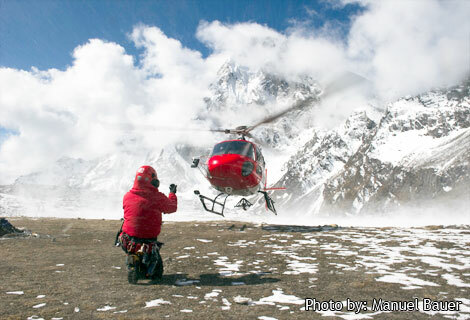 Some of the highlighting missions included in the film were the rescue of sick and injured clients from different mountains; the recovery of an American Climber from Everest Camp II by Captain Siddhartha Gurung. Next was when the team carried out a sling operation to bring down the body of a deceased South Korean climber who was lost at Mt. Manaslu last year. 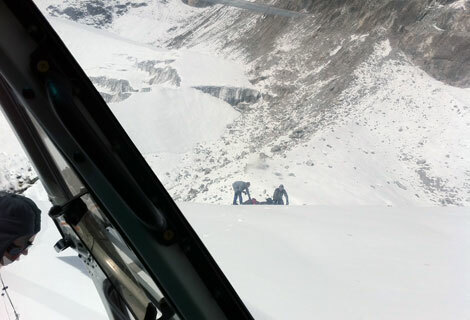 Training on crevasse rescue, human sling and cargo sling of Fishtail Air crew by Air Zermatt at Kalapatthar and other areas has been focused on as well. Carrying out the Hydro power plant’s cargo shuttles widened the range of mission capabilities and gave a new platform to cargo transport in Nepal. The emotions involved in all the missions carried out every other day are priceless. Our whole team included in every little detail of the work hope that this film lets the viewers have an insight and believe for themselves that The Himalayas is but a Safe place where Nature is at its very Best! This film is being produced as a 3 part series (each of 51minutes) and would be aired at prime time on Swiss National Television and on Servus TV, Austria. For the international audience it is being made into a 95-100 minute documentary. This is supposed to be an intercultural project between Swiss and Nepali filmmakers. The team believes this to be a unique film about pioneering, hardship and faith. The entire filming of the tough Training of our crew, Rescue missions, Sling operations and related stories has officially been completed here in Nepal. We cannot wait to watch the documentary and will soon let you know when it’s out. We thank and appreciate the effort and interest of Frank Senn of Swiss National Television and Hari Thapa of Nepal. A cardio patient was flown from Bharatpur Medical College to Kathmandu’s Norvic International Hospital for extensive cardio treatment. 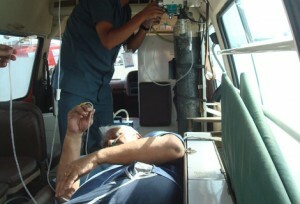 The patient, who is an Indian citizen, was flown to Kathmandu from Bharatpur on 2nd October 2010. Capt Stephan and Capt Gregor were in charge of the flight. ‘Dashain’ is one of the most important festivals observed by Nepalese. It is a time for family get-togethers, for feasting and merry making. While Nepalese are busy preparing for the festivities, there are some who are facing food scarcity. 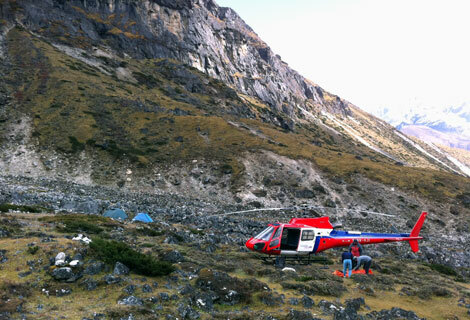 Ahead of the Dashain season, Fishtail Air’s helicopters and pilots are busy carrying food grains to remote areas in western Nepal. 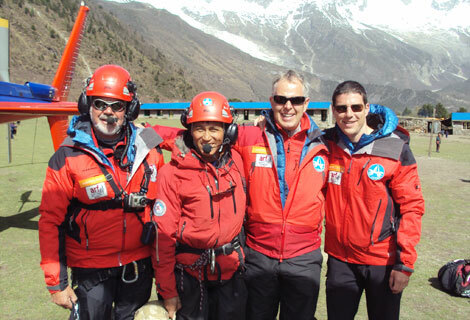 So far the pilots have flown more than 1200kg of rice to the remote district of Humla.